NOTICE: This component is deprecated as of YUI 3.9.0 and will be removed in future versions. If you require functionality similar to the one provided by this module, consider taking a look at the various modules in the YUI Gallery. The MenuNav Node Plugin has a small footprint of ~5 KB (GZIP'd) and requires a minimal set of dependencies. The MenuNav Node Plugin was built with both accessibility and usability in mind. The MenuNav Node Plugin implements established mouse and keyboard interaction patterns to deliver a user experience that is both familiar and easy to use. To that foundation the MenuNav Node plugin adds support for screen readers through the use of the WAI-ARIA Roles and States. The MenuNav Node Plugin is easy to configure. The visual presentation of menus is controlled completely via CSS. A handful of straightforward configuration attributes can be used to make common modifications to a menu's behavior. No menuing system would be complete without an <iframe> to prevent <select> elements from poking through menus in IE 6. To include the source files for MenuNav Node Plugin and its dependencies, first load the YUI seed file if you haven't already loaded it. Note: be sure to add the yui3-skin-sam classname to the page's <body> element or to a parent element of the widget in order to apply the default CSS skin. See Understanding Skinning. Submenus are defined by wrapping the the menu markup in an <li> element. Each submenu must have have a label. The label should preceed the menu markup, and the label's href attribute should be set to the point to the id of its corresponding submenu. With the markup for the menu in place, simply get a Node reference for the root menu and then call the plug method, passing in a reference to the MenuNav Node Plugin. //    the root menu (<div id="menu-1">). Therefore, since "this"
//    represents a Node instance, it is possible to just call "this.plug"
//    passing in a reference to the MenuNav Node Plugin. The default "Sam" skin provides two additional visualizations for horizontal menus, each of which can be applied by both changes to the menu label markup and through the application of a class to the node representing the root menu's bounding box. The first of the two optional horizontal menu visualizations available with the "Sam" skin renders each menu label as a menu button; each menu label is rendered with an arrow to the right of its text label, providing a visual cue that there is a corresponding submenu. As a final, optional step, use the autoSubmenuDisplay and mouseOutHideDelay configuration attributes to configure the menu labels to behave like menu buttons. Set the autoSubmenuDisplay to false, so that each menu label's submenu isn't made visible until the label is clicked. Set the mouseOutHideDelay to 0 so that a label's submenu is only hidden when the user mouses down on an area outside of the submenu. The other optional horizontal menu visualization available with the "Sam" skin renders each menu label as a split button. Next, define the markup for each menu label. Start with a <span> with a class of yui3-menu-label applied. Inside the <span>, place two <a> elements  one for each of the label's two clickable regions. Each <a> has separate, but related responsibilities: The first <a> represents the label's default action. The second <a> toggles the display of a submenu whose content contains other options related to, or in the same category as the default action. Therefore to configure the first <a>, simply set its href attribute to any URL. For the second <a>, apply a class name of yui3-menu-toggle, and set the value of the href attribute to the id of the label's corresponding submenu. Lastly, the text node of the second <a> should label the contents of its corresponding submenu. Use the autoSubmenuDisplay and mouseOutHideDelay configuration attributes to configure the menu labels to behave like split buttons. Set the autoSubmenuDisplay to false, so that each menu label's submenu isn't made visible until the menu trigger is clicked. Set the mouseOutHideDelay to 0 so that a label's submenu is only hidden when the user mouses down on an area outside of the submenu. The MenuNav Node Plugin makes it easy to create separators between items in a menu. To separate items in a menu, simply place items in their own <ul> elements inside their parent menu's content box, and apply a class name of first-of-type to the first <ul>. 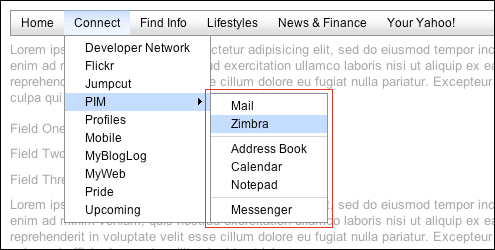 The following code will render separators between the "Zimbra" and "Address Book" items, and the "Notepad" and "Messenger" items. The MenuNav Node Plugin manages the state of a menu's descendants through the application and removal of class names. Class names representing state are constructed using the descendent's name followed by a suffix representing the state. For example, hidden submenus have a class of yui3-menu-hidden. Class names used to represent state are always applied to the descendant's root node. See the CSS reference for the complete list of state class names. By default all submenus are hidden and that state is reflected by the application of the yui3-menu-hidden class name. If the yui3-menu-hidden class name is not applied to the bounding box node of all submenus, it will automatically be applied by the MenuNav's constructor. When a submenu is visible, the yui3-menu-hidden class name is removed and a class yui3-menu-label-menuvisible is applied to the submenu's corresponding label. The MenuNav Node Plugin has several configuration attributes that can be set via an object literal that is passed as a second argument to a Node instance's plug method. (Note: These attributes are case sensitive.) In the following example, the value of the mouseOutHideDelay attribute is set to 1000.
useARIA True Boolean indicating if use of the WAI-ARIA Roles and States should be enabled for the MenuNav. Set to true by default for Firefox 3 and Internet Explorer 8 as currently only these browsers have support for ARIA, and are supported by several screen readers for Windows that also offer support for ARIA. autoSubmenuDisplay True Boolean indicating if submenus are automatically made visible when the user mouses over the menu's items. submenuShowDelay 250 Number indicating the time (in milliseconds) that should expire before a submenu is made visible when the user mouses over the menu's label. submenuHideDelay 250 Number indicating the time (in milliseconds) that should expire before a submenu is hidden when the user mouses out of a menu label heading in the direction of a submenu. mouseOutHideDelay 750 Number indicating the time (in milliseconds) that should expire before a submenu is hidden when the user mouses out of it. For additional information on listening for DOM-related events, see the DOM Events section of the Node landing page. The MenuNav Node Plugin uses an <iframe> shim to prevent <select> elements from poking through submenus in IE 6. The <iframe> shim is only used for IE 6, and for performance its creation is deferred until the first time a submenu is made visible. Once created, the <iframe> shim is appended to the node representing a submenu's bounding box, and is therefore a sibling of the the a submenu's content box. All styling of the <iframe> is handled by the core CSS file for the MenuNav Node Plugin, so authors of custom skins won't have to worry about it. The markup template used to create each <iframe> is accessible via the SHIM_TEMPLATE property. yui3-menu Applied to the element representing a menu's bounding box. yui3-menu-content Applied to the element representing a menu's content box. yui3-menu-hidden Applied to a menu's bounding box when hidden. yui3-shim Applied to the element serving as a menu's shim. yui3-menu-horizontal Renders a menu horizontally. Applied to a menu's bounding box element. yui3-menu-label Applied to the element representing a menu's label. yui3-menu-label-active Applied to a menu's label when it is a MenuNav's active descendent. yui3-menu-label-menuvisible Applied to a menu's label when its corresponding menu is visible. yui3-menuitem Applied to the element representing a menuitem's bounding box. yui3-menuitem-content Applied to the element representing a menuitem's content box. yui3-menuitem-active Applied to a menuitem when it is a MenuNav's active descendent. 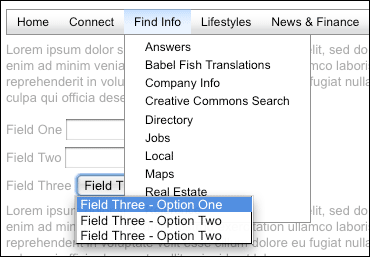 first-of-type Applied to the first <ul> element inside each menu's content box. In Safari 3 and IE 6 the <select> element's popup menu is modalmaking it impossible to interact with any of the other elements on the page, and therefore impossible to both trigger the display of a DHTML menu and impossible for the <select> element's popup menu to potentially poke through a DHTML menu. In all other browsers, a <select> element's popup menu is both not modal and has a zindex higher than any other element. The established best practice of using an <iframe> element has a shim does not fix the problem. Currently there is no fix for this issue.